-As we left my car and walked to the diner, our usual server was in the parking lot saying hi to some people. She said, "Hi, ladies, I'll be right in to serve you" and smiled at us. When she came in, she came right over and said to me "coffee and water, right?" and knew we would all be ordering egg biscuit sandwiches. 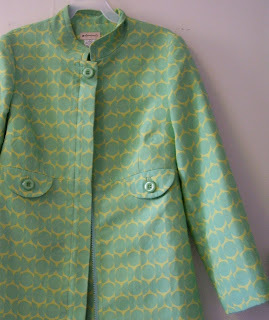 -Finding a great spring coat at Finder's Keepers, a resale shop I love. 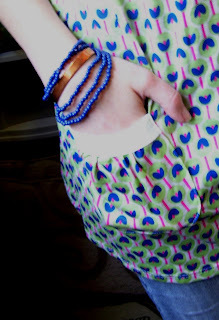 It's a perfect fit (sleeves and all), and has a great pattern of blue-green circles. The brand is even great: "elevenses," a Lord of the Rings reference. While I thought we never have much spring here, just winter and summer, we had a cold front last night and I got to wear it. -Catherine giving me a huge wave as she walked past my window and then, on her way back, calling. In a modern tapping on my window, she called my cell phone so I wouldn't be startled by someone at my window. I opened it, and enjoyed catching up for a few minutes with her. -At youth Bible study, I asked for a volunteer to close us in prayer. Michael's hand shot up, and with a big grin, he said, "I will!" 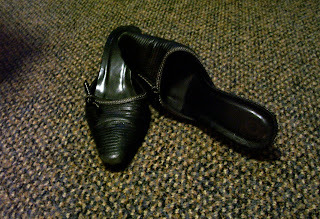 -Kicking off my shoes at the end of the day. -The sigh that comes with reading the last line of a good book and closing it. -Hearing children talk and laugh outside my window. 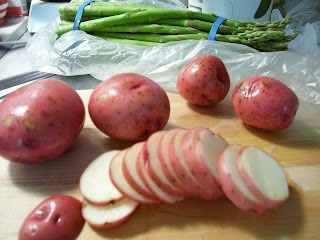 -The earthy, rustic smell of potatoes as I slice them. -Hearing the news that, after the first-time-ever meeting of Gerry Rice and Ian Paisley, Sinn Fein and the DUP have agreed to share power in Northern Ireland's government. After 30 years of violence inflicted by each community on the other, these politicians who often called for and heightened such violence, are finally calling for peaceful political progress. 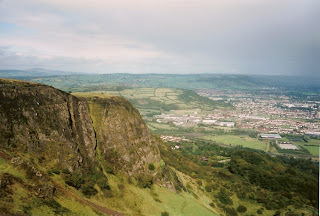 This means that Northern Ireland will no longer be direct ruled by Parlaiment in England, but will finally have its own functional Parlaiment. -A very warm wave from the man in the car next to me at a light. He was so friendly it seemed like we were long lost friends. 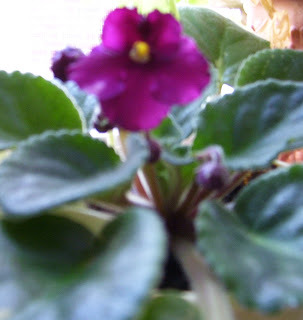 -Noticing that my African violet has bloomed again. -Making the most of an hour-long wait to eat with friends at our favorite restaurant. We tailgated in the parking lot by getting some chips and salsa, turning up the radio and hanging out on a blanket. -A fascinating conversation on God and politics with strangers in the coffee shop. -Receiving kind and helpful affirmation from professors and friends in my Mid-Course Assessment. The MCA is an evaluation that second-year seminary students go through to determine if they can be a candidate for graduation in the degree program. In all the busyness and demands of middler year, it's really nice to receive some feedback from the community about your work so far, your call and your gifts. -A father lifting his daughter up into the air to avoid a puddle. 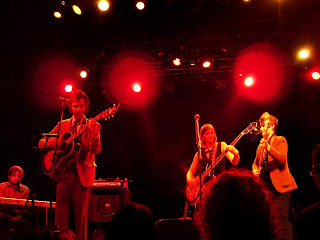 -The energy and depth of the Everbodyfields and the Avett Brothers at Variety Playhouse last night. The Variety is a great old art deco style theater, and combined with three-piece suit-wearing performers playing a fusion of old bluegrass and new rock, it felt like the past and the future simultaneously. -A tiny, periwinkle blue butterfly that fluttered in front of me as I walked outside. 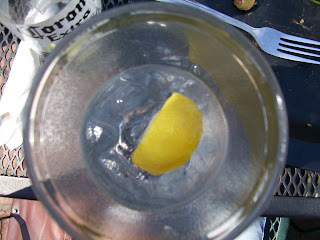 -The lemony coolness of water at our theology-midterm's-over-celebratory lunch outside with friends. -Being called "ma'am" by a six-year-old at church. She was wearing a tinsel halo, and I said, "Are you an angel?" Her reply was, "Yes ma'am." I then told her she looked very pretty and she said, "Thank you, ma'am." -Spending my ten minutes between working in the bookstore and babysitting Logan by lying on a blanket outside with Margaret, Claire and Claudia. The warm sun hitting my face as Margaret read me some poetry was a blissful, relaxing moment. -The bright purple flowering trees all around Atlanta that scream "Spring" at me as I pass them. -The opening bars of my Out of Africa record. 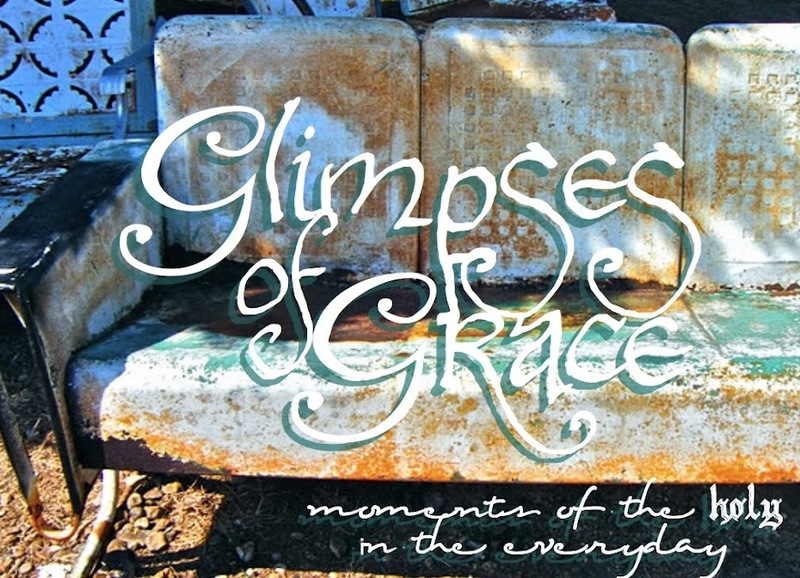 The first song makes me nostalgic for South Africa and my home in Texas simultaneously. I think Out of Africa is the most beautiful record I own. -Seeing a beautiful orange sunset through the window while we studyied theology. 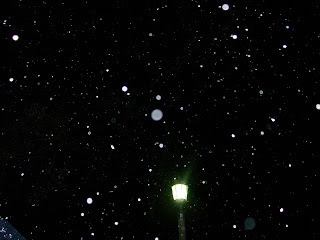 It was especially pretty because it shone from behind a tree with white blossoms. -The little pockets in my comfortable, retro-print shirt that are the perfect size for my chapstick. -A funny and inspirational email from my Grandmother. My favorite line was, "Happiness comes through doors we didn't even realize we left open." -Listening to our bus driver Eddie sing along to the radio. He was singing along to "Cruisin," and even hitting most of the high notes. -As a school bus pulled up next to a car, the two vehicles began waving and honking at each other. This lasted until the car had to turn left. As she drove by me, I saw that she was smiling to herself. -Finding some interesting, old books at a resale shop: one on biology, one on the history of jazz and a novel. -Attending the Christian Peace Witness for Iraq in Washington, D.C. yesterday. 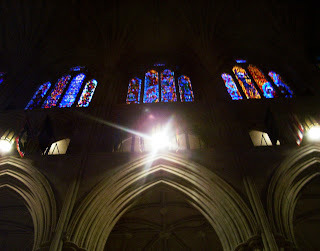 The ecumenical worship service at Washington National Cathedral was amazing, with bold and prophetic words spoken by many diverse people with diverse stories. Especially moving were the words of a woman who lost her son in Iraq, Rev. Raphael Warnock (the minister at MLK's home church, Ebenezer Baptist) and Rev. Jim Wallis (author of God's Politics). -Walking to the church for worship, we walked through literally freezing rain and sleet, preparing ourselves for a long and very cold night. As 3,000+ of us stepped out of the church to begin the 3 1/2 mile walk to the White House, it began to snow instead of rain. It was beautiful. -The tiny light of my little candle among so many others, and the realization that, yes, this one candle makes a difference. It was such a witness to the reconciling love of Jesus Christ to walk past many foreign embassys and wave our candles at people peering out of their windows. They waved back, smiling. -The trees all around Decatur that have suddenly burst into white blossoms. 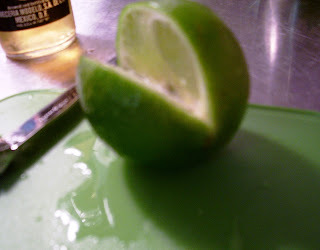 -The fresh smell of a lime as I cut it into wedges. -Driving a different way to work just to break up the monotony, and seeing different scenery. 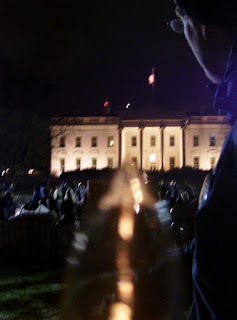 I am leaving tonight to go to Washington D.C. for the Christian Peace Witness. At least 30 of us are driving up on a bus, and will be back on Saturday. I won't be able to post for a couple of days, but I'm certain there will be many "glimpses" there to share when I return. -A woman in the bookstore who bought a book of prayers and said, "Sometimes you just don't feel like praying, and so you pray someone else's prayers." She then explained that she lost her husband of 50+ years recently. She showed us a picture of him, and talked about who he was. The amount of affection in her voice was amazing. -A professor providing some much-needed affirmation. 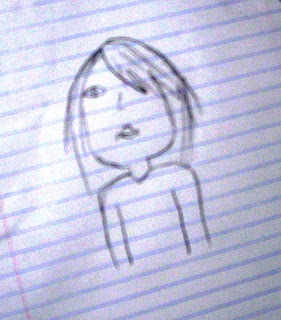 -Logan's portrait of me she drew while I was babysitting her yesterday. 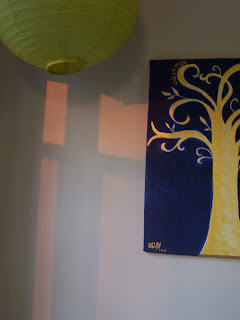 -The orange glow of the setting sun painting my wall (and one of my paintings) as it shined through my window. -Coming up with such creative team names at trivia last night that the announcer laughed as he tried to say them, and other teams clapped for us. We're far more concerned with the right name than with the right answer. -Waking up still feeling that it's an hour earlier, and then hearing birds joyously chirping outside my window. Daylight savings time doesn't phase them. -At youth group "game night," I glanced over to see Katherine wearing the parachute we had been playing with. She had poked her head through the hole in the middle and was smiling proudly, engulfed in rainbow colors. 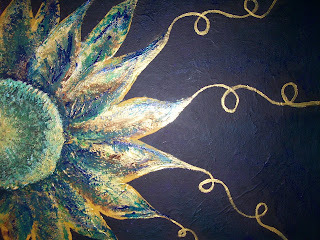 -Experiencing the joy of paint on canvas myself, and finishing a painting I've been working on. Normally when I paint, it's all very predictable and I just paint what I see in my head, but last night I just played. It turned out more wild, layered and interesting. -At Fred's art show last night, he spoke of joy: the joy of Mary anointing Jesus with her bottled-up joy, the joy of faith and the joy of paint on canvas. Through his words and beautiful paintings, Fred imparted some of his joy to me. 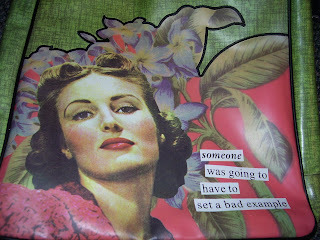 -A woman in church today, having read my blog, asked why I had a "difficult week." It was so nice of her to notice and ask, and then share with me very encouraging words and some of her own story. 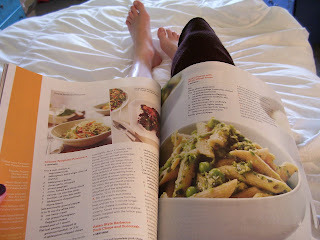 -The luxury of relaxing with a Coke and reading a magazine after washing dishes, potting plants and cleaning up. -Playing the piano while babysitting Logan. 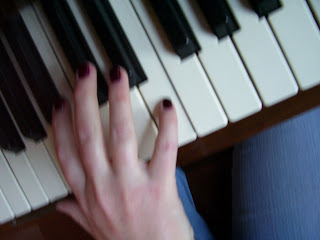 It was incredibly therapeutic, and I loved the look of my wine-colored nails on the white and black keys. -It's been a challenging week, so coming home to find a pot of bright red tulips outside my door with a note, saying: "Whit, We love you!" from my friends Rob and Karen was just what I needed. I felt so loved. -Karen cooked Sarah and me (Kate, we missed you) dinner, and it was delicious eggplant rollitinis. 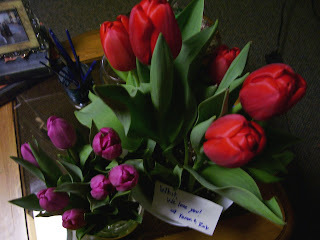 Sarah also brought us flowers (pink tulips--my second for the night! ), and we laughed and talked and ate for hours. When I came home, there was a little bag of Girl Scout cookies hanging on my door from Erin to brighten my day. What great friends I have. -As Katherine put her arm around Caitlin in chapel, Caitlin turned and smiled at her. -While babysitting Logan, she wanted to make "food" out of mud. It was so fun to get our hands dirty and play imaginatively. I love that, even with all sorts of technological toys these days, a kid can still be entertained by making mud pies. -Claire bringing me a vintage-looking, sassy bag from the Clothes Closet. It has such personality. I think I'll make it my new bookbag for school. -At Trivia last night at Twain's, more and more of our group kept arriving at different times, with happy greetings each time. This Monday night ritual is one of those centering times, where laughter, jokes and good friends are always there (we even win occasionally). -Falling asleep to the sound of a train echoing through my window. Everywhere I've lived--Texas, Northern Ireland, Atlanta--I can hear a train from my room. Their long-lost whistles always make me feel at home. 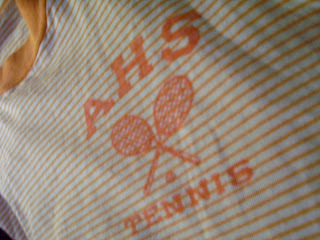 -Sleeping in my Aunt Karen's old tennis shirt from high school. It's the closest I'll get to being a tennis star. 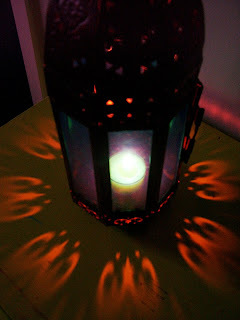 -The way my lantern glowed fun sunflower-like patterns onto the table. -Watching Why We Fight with friends last night. It's a provocative and eye opening look at the military industrial complex in America, especially post-World War II. It was also a winner at the 2005 Sundance Film Festival. The words of Eisenhower's farewell speech at the end of his term were especially prophetic. -A leisurely lunch with Leslie. This is my 100th post! Thanks for reading, everyone. -Singing songs and playing guitar with friends last night to celebrate Margaret's birthday. -Sleeping in for the first time in ages. 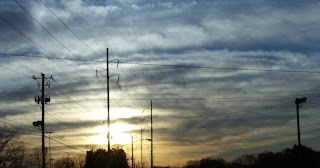 -The swirly clouds tonight, dramatized by the beginning of a sunset. -Drawing pictures to demonstrate different Presbyterian polity themes in class today. We definitely made the Book of Order as interesting as possible. -Jae showing me what my name would be in Korean. It means "dense, flourishing Earth." I love that. -Coming out of the cold into the cozy diner for breakfast with Sarah and Karen. That first cup of coffee warmed me right up (as did the eggs, sausage and homemade biscuits). -A friend taking the time to help me fix a computer problem. 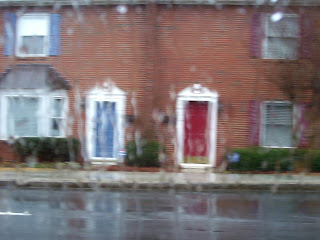 -The way the rain on my window smeared the colored doors of homes as I drove by. I think Monet must have been inspired by staring out a rain-streaked window.